OCTOBER WEEKLY VOTING INCENTIVE!!! ADDAMS FAMILY COSPLAY!!! The Puck peoples … as members of the Addams Family? It’s one crazy family dressing up as another crazy family! And it’s happening all throughout October! 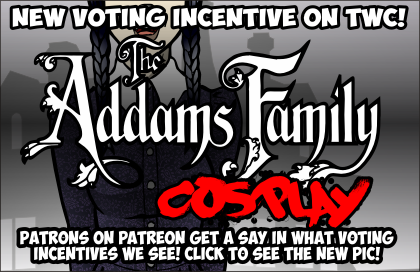 Ooh, and remember, this voting incentive was chosen by special fans who donate $5 or more a month! If you want to join their controlling ranks, HEAD ON OVER TO PATREON and join the select club! VOTE BECAUSE I REALLY NEED VOTES, MAN!!! I think we all saw some form of this joke coming. I can’t fight against the tide when the tide’s that strong. So here it is. Daphne’s away on a Mission-O-Mischief. She’s JUST OUT OF FRAME!!! Seriously! That’s what she wants you to think ! I mean, just check out the VOTING INCENTIVE. Daphne’s version of EVIL would make Satan cringe. You really don’t know what you have created ! It’s oossible that Colin planned to make Puck mad at him in order to make himself feel batter about the surgery…. Nah, unlikely, this is Colin. Do you think that he’s got two thumbs? He did it before. Puck visibly frightened for his wellbeing is more upsetting to Colin than Puck angry. had he stopped before Phoebe’s b00bs, he’d have been saved. and passed as a family man. So his trouble would be slightly smaller. Colin is pretty much totally unable to EVER quit while he’s ahead. Oh–Kaaaaay! Now THAT’S the Puck we all know and love! btw, Kudos on the incentive! I mean, who wants the kind, loving, supportive Puck? 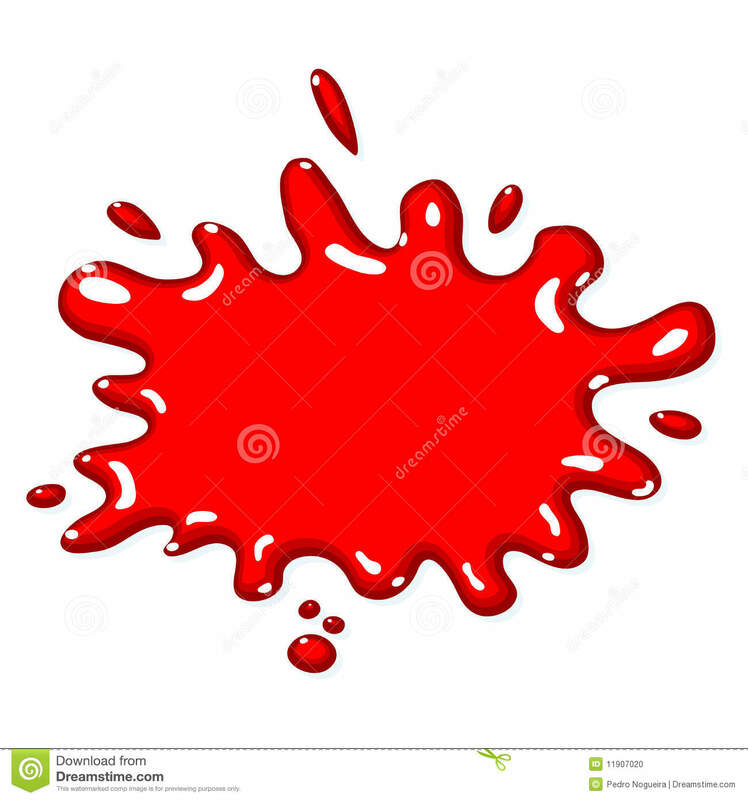 WE WANT BLOOD! Yes, the Wednesday incentive WORKS ! It is the bright spot of the entire series – so far. Just wait for the Tracee one. NOOOO! Not a Tracee one! You said she was Thing?!?! HOW?! The latest cosplay is my fave. 😛 Daphne = Wednesday = Life itself. Good. Ask if they’re accepting volunteers, Puck. She could do so much good in the hospital! So many opportunities to injure people and … wait, no. So many people in WHEELCHAIRS that Robin can BEAT ! But who will the male and gay nurses flirt with? Besides, Puck has muscles! Anyway, nurse’s aides serve the same function as orderlies, but are lower status. But no muscles. Go figure. And she shall make him a necklace of it and hang it around his neck for remembrance. That’s horrifying. But also delightful. My boss had a party one time (she is a surgeon) and one of her ex-interns told me that rumor had it when she was chief resident that she had a collection of house staff “boys” nailed to the wall of her call room. She denies this, but with an evil (and reminiscent) smile on her face. I believe too much in the darkness of human soul to think this isn’t true. Either great minds think alike, or my comments from the last page inspired a fair bit of dialogue in today’s page. You cannot prove that your comments were the source of this week’s strip. Meanwhile, Miranda is loving Mr. Rubber Ducky to bits. Rubber ducky, you’re the one. You make pre-op lots of fun. Especially when you’re still too young to understand what’s going on. Are you ever going to develop Daphne’s backstory? I understand the value of keeping her origins vague, but I think eventually you should introduce one. I don’t mean to be presumptuous, but I think it could make for an interesting story arc. By the way, you’re an excellent artist and I find your comics very entertaining and interesting. I have had some form of Daphne back story, where she meets her birth mother, kind of cooking on the back burner since I started the comic. And that was 20 years ago. So yeah, I might go there sometime. May happen. MAY? It must! Please! Or I will die! I probably shouldn’t have put interesting twice in a 4 sentence comment. Your comics are exceptionally entertaining as well as captivating. Well, thanks! And yeah, I’m like that with words too. I get a word in my head and my subconscious and just use it over and over again in writing. It’s always weird words like “inalienable” too. Me too. That Mark. What a smart guy. Why do I get the feeling that the reason he didn’t mention Puck is because, while he does (sort of?) love her, he’s also terrified of her at the same time? Would make sense. To me, at least. Still, Colin being Colin, I think he has other reasons for not mentioning her. Who knows! (You probably do. You’re the creator, EG). Puck is probably the most omnipresent element of his life. I think it’s sometimes easy to overlook those parts of life. THIS could be next week’s comic ! Well, it would save me drawing time, that’s for sure. Tyler wisely keeps Puck’s BFF between him and the Red-Headed Rage. For some reason, Colin’s last line sounds in my head like Snagglepuss’s “Exit, Stage Left!” if Hanna-Barbera were Canadian. Robin can be such a Fagus Grandifolia ! Tyler wasn’t even originally IN that panel. I added him in post. And I’m not sure a Canadian Snagglepuss would sound much different. He’d say ‘eh’ more. All tales are Winter’s Tales in Canada. Can’t say as I blame Colin for fixating on Phoebe’s Ta-tas…I have no doubt they are devilishly delightful! Besides, focusing on the inconsequential is often what gets us normal humans past the prospect of losing those things that matter most to us. Colin is just distracting himself from the thought of possibly dying and losing Puck (even if the odds are slim to none). I kinda’ hate to point this out, but there is a devious side to Colin when it comes to “Getting His Way” with the Ladies. I think Colin was pushing the envelope here, just to see if his “Sad Scenario” could result in some “Pity pr0n” from Phoebe. That … is actually a thoughtful explanation. I like that. This comment could be featured on pretty much every comic in this whole series. Even the one where Daphne got an iPad for peeing in Heather’s luggage? Wait, on second thought, you’re right. The fact that Wednesday Addams is one of Daphne’s personal heroes makes me inordinately happy. It makes sense, right? I felt that it made sense. I do not mind at all. Though the resolution is kind of low so it’ll probably look kind of yucky. Mebe you can upload a Hi-Res for Patreons ? Well worth a buck, I’d say. Yes. I could totally do that. Careful what you say to someone. It may be the last thing you ever get to say. Especially if that someone is Puck. This is why my Human Pets, Baldie and Janet, always – ALWAYS, kiss each other hello and goodbye. GET THE OWO CHROME EXTENSION! GET IT RIGHT MEOW! This would have been more appropriate ONE WEEk ago ! It is bewond hawibble ! Is gear two the violent one? Hee hee, my bf finished my early birthday present today. It’s not precisely what I asked for, but he said he couldn’t see Phoebe doing that, but it was right up Puck’s alley. I love the way he drew Daffy’s “face”. I’ll get it scanned and post it on my Imgur account. We are all very curious.